i-sense researchers from Imperial College London and UCL have recently published landmark research on the development of a paper-based point-of-care test for HIV that surpasses the sensitivity of the current industrial gold standard for detection of p24, an early biomarker for HIV. 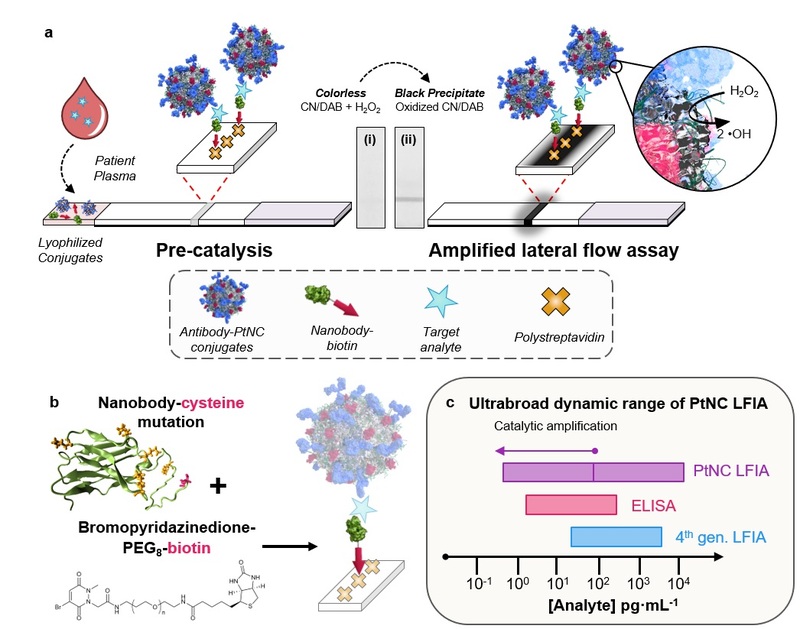 The research paper, titled ‘Platinum Nanocatalyst Amplification: Redefining the Gold Standard for Lateral Flow Immunoassays with Ultrabroad Dynamic Range’ and published in ACS Nano, demonstrates significant advancements in absorbance-based lateral flow immunoassay (LFIA) technology. A patent application has also been filed on this new technology, which employs nanoparticles with enzyme-mimetic properties to increase the sensitivity of simple paper-based diagnostics. The emergence of infectious diseases is one of the greatest threats to human health. The recent outbreaks of Zika and Ebola viruses, and the ongoing HIV pandemic continue to highlight the need for diagnostic tools that are affordable, sensitive, simple, and able to rapidly detect pathogens under challenging circumstances. The serum-stable, nanoparticle catalyst-labelled LFIA has addressed this issue and has a better sensitivity than any current commercial or published report for paper-based detection of p24, one of the earliest and most conserved biomarkers of HIV. Dr Gray also led the early evaluation of the test with sero-converter patient samples and health controls. The test has been carefully tailored to demonstrate the utility of both nanobody and nanocatalyst components for LFIA to move towards a simple, robust, and highly amplifying system. The result is a test that is easy to use and can be read by the naked-eye or by a mobile phone camera, ideal for mobile phone-connectivity. Although many similar assays require controlled temperatures for storage, which could increase costs, hinder supply and prevent use in hot climates, this new test has excellent stability within varying temperatures making it ideal for use in developing countries. Lead senior author, Research Director for Biomedical Materials at Imperial, and i-sense Deputy Director, Professor Molly Stevens says “Our test shows very promising stability under harsh conditions, such as elevated temperatures and long-term storage, and we are excited about translation to a field setting." Although tested initially on HIV, the patent application covers a range of diseases in demand of innovative diagnostic tools targeting low level protein detection in complex fluids. Additionally, the test’s broad dynamic range may enable it to be used more broadly as a diagnostic with potential for monitoring therapeutic efficacy and disease progression.